Dr. Adalí Efraín Vélez is a Diplomate of the American Board of Endodontics. He was born in Adjuntas, Puerto Rico. He earned a BS in Pharmacy and DMD degrees (1977 & 1982) from the University of Puerto Rico Medical Sciences Campus, Rio Piedras, PR. In 1993 he received a Masters in Arts of Religion (MAR) from the Evangelical Seminary of Puerto Rico, and then obtained his Certificate in Endodontics from the University of Texas Health Science Center at San Antonio (1997). Dr. Velez is a skillful, experienced, and cordial clinician, who relates well with people. He was an Adjunct Assistant Professor at the UTHSCSA, San Antonio, Texas Department of Endodontics for 4 years. He loves to travel, read, and study a diverse range of subjects including Religion and Humanities. He is married to Ana Ines and together they have a son, Efrain Edgardo, who is a Designer and Registered Architect. He is married to Lucy Guevara Vélez, Ph. D. and together they have two sons by the name of Nicolás Efraín and Edgar Rafael. They live and work in Austin Texas. Dr. Iván E. Rodriguez was born in Arecibo, Puerto Rico and grew up in Quebradillas. He received a BS in Biology (1987) from the University of Puerto Rico, Mayagüez Campus, and earned his Dental Degree (DMD) from Washington University, in St. Louis, MO.(1991). He completed two additional advanced certificates: one in Oral Diagnosis & Radiology (1994) and the other in Endodontics (1996), both from the University of Texas Health Science Center at San Antonio. Dr. Rodriguez is an excellent clinician, friendly with all, and known professionally as an accurate diagnostician. He loves outdoor activities and enjoys reading and sharing with his family. Dr. Rodriguez is a past president of the Rio Grande Dental Society and past local delegate to the Texas Dental Association (TDA). He is married to Annette, and together have three children, Ivan Enrique (Ivancito), a student at Texas A&M, College Station, TX, Adriana Gabriela, and Alberto Jose. Dr. Ernesto Gerardo Treviño is a Diplomate of the American Board of Endodontics. He was born in San Benito and raised in McAllen, TX. He is a native of the Rio Grande Valley, and has enthusiastically returned home to serve his community after finishing a solid academic carreer. He holds a BS in Biology (2003) from UTSA, a Dental Degree (2006), and Certificate of Endodontics (2009) from UTHSC-San Antonio, and an Advanced Education in General Dentistry Residency from the VA Hospital in San Antonio, TX (2007). He has the latest, most advanced, and cutting-edge training that an Endodontist can receive, most important of which are his skills in endodontic microsurgery and pulpal/ endodontic regeneration. In 2012 he was the recipient of the prestigious Texas Dental Association's New Dentist Leadership Award and currently serves as President of the Rio Grande Valley District Dental Society. He is also Chairman of The Texas' New Dentist Committee. 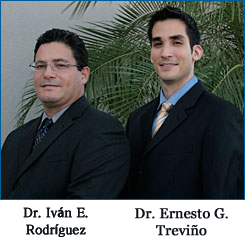 Dr. Trevino enjoys spending his free time with his family as well as outdoor sporting activities. He plays the piano and cello...and is also passionate about being active with his Church. 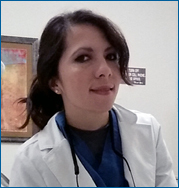 RGV Endodontics, LLP would like to introduce Dr. Stacy Renay Beltran, Periodontist who has been working in our offices. Dr. Beltran is a native of Rio Grand Valley, born and raised in McAllen, Tx. She attended Our Lady of Sorrows Catholic School and the Science Academy of South Texas before receiving her undergraduate degree at the University of the Incarnate Word and D.D.S. from Baylor College of Dentistry. She is an active member of the Rio Grande Valley Dental Society and Board member of the McAllen Evening Rotary Club. Dr. Beltran is involved in the South west Society of Periodontist, American Dental Association and holds diplomat status of American Academy of Periodontology. Dr. Beltran is a strong supporter of a healthy lifestyle, She is active in protecting animal rights and is a proud vegetarian and advocate for plant-based diets. You'll often find Dr. Beltran riding bicycles, walking her dogs Baylee and Charlie, or spending time with friends at South Padre Island. 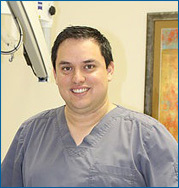 RGV Endodontics,LLP would like to introduce Dr. Arturo Salinas, Periodontist who was born and raised in McAllen, Tx. Dr. Salinas attended the University of Texas at Austin where he obtained his Bachelors of Science in Civil Engineering. He went on to complete a Bachelors of Science in Biology from the University of Texas Pan American, and acquired his D.D.S. from Baylor College of Dentistry. Dr. Salinas completed his residency in Periodontics in 2017 from the University of Nebraska Medical Center. He has three beautiful children; identical twins Madison and MacKenzie, and his third daughter Macie. Dr. Salinas enjoys spending time with his wife and three children, and, when time permits, playing golf with his dad and two brothers.